So, being in a long distance relationship is rough. I used to think a two-hour drive was bad, but it’s cake compared to the 16-hour fiasco I am dealing with now. The distance definitely blows when holidays or your birthday comes around and it’s just not feasible to travel that far. Even though I have never been a celebrator of Hallmark’s favorite card selling day, Valentine’s Day, (I made this fact up), it is yet another reminder of how far away my dumb boyfriend is. You can totally get all of your homework done and only be distracted by food, the TV, your dog, rain, or whatever else is around that seems more fun than homework. You can talk to your dog all day without someone else thinking you’re weird. No one to judge seven-day-a-week pizza habit. “Law and Order SVU” marathon again. Watch me. Ice cream social for one. But seriously, I probably wouldn’t be able to do everything I need to do for my thesis if zee man was here, so I guess that’s the upside even though it doesn’t feel that way. 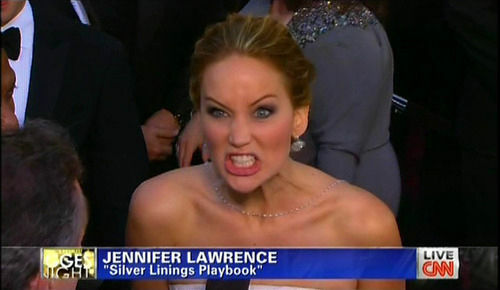 You have to find that silver lining, right Jennifer Lawrence? …the troubles of being a girl 😉 Thanks Mary! Reblogged this on Operation: Grad School.